When I was 18 years old, my brother, Big Al, invited me to stay at his ranch in Saipan, M.I. for the summer. Growing up, I idolized my bro and wanted to be just like him. My first weekend at the ranch he slaughtered a pet cow, a pig, and a few chickens. Seeing these innocent animals butchered was it for me, no more eating meat. I made the decision to help preserve earth’s natural resourses and I realized that I love animals and that I am ethically opposed to eating them. In my mind, I could hear the old tapes of my Mother promoting the benefits of vegetarianism. My Mom did not eat meat and she ran the Tinman Marathon (swim,bikea, run) and still had the energy to be a Continential Pilot. I knew I didn’t have to eat meat to be healthy and vegeterianism was a better choice for me. My father, was a physician in the US Navy and encouraged all four kids to make up their own mind on food selection. My first job was working at MacDonalds on Guam. They provided me with an excellent work ethic, “if you have time to lean you have time to clean”. 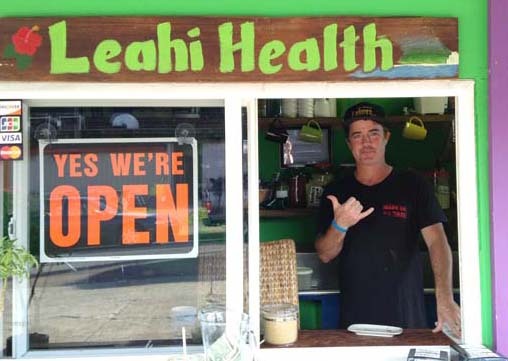 Today, I use that motto at Leahi Health. Research confirms that 72% of all diseases, including cancer, are diet related. A vegetarian diet reduces the risk for chronic degenerative diseases such as obesity, coronary artery disease, high blood pressure, diabetes and certain typesof cancer including colon, breast, prostate, stomach, and lung cancer. Grandma Coleman, lived to be a healthy 101 years old. She told me that her secret to longevity was apple cider viniger every morning and loads of vegetables. 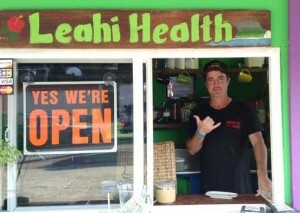 I am proud to say that the number one benefit from Leahi Health is more ENERGY. A vegetarian diet is free of artery-clogging animal products which physically slow your body down. Fruits, whole grains, vegetables, legumes are high in complex carbohydrates and will ENERGIZE your body.